Introducing Sophie, born May 17th! An old Peace Corps friend posted this link on Facebook. It reminded me of the work I did as a Peace Corps Volunteer in Ghana. In many parts of rural Africa it is still normal to have no access to a toilet or latrine, and it is still normal to get water from unsafe sources. It would be great to see more attention placed on this issue, but it tends to get ignored (as are children in much of Africa). Millions of children’s lives are being put at risk each year because aid agencies and governments make wrong choices about health care priorities. This is the conclusion of a new report from the charity WaterAid. It says that diarrhoea caused by poor sanitation is killing many more children than HIV/Aids, tuberculosis and malaria combined. The report says the global spending on HIV/Aids hugely outweighs the amounts spent on providing better sanitation. Many of you have heard of the recent tragedy here at Wesleyan. A student was shot and killed yesterday by a man who — reportedly — harrassed her in the past. Fortunately, the suspect turned himself in this evening. Hopefully, the campus will be able to heal and recover from the tragedy. I have only been here a year, but I can tell that such incidents are far from the norm for this university community. This is generally a safe place. I hope people will be able to feel that way again soon. MIDDLETOWN – The massive manhunt for the man accused of killing a Wesleyan University junior is over. Stephen Morgan, Suspected In Killing Of Wesleyan Student Johanna Justin-Jinich, Turns Himself In — Courant.com. On Thursday, the minister for humanitarian assistance, Haroun Lual Ruun, said Khartoum would allow those UN agencies and non-governmental organisations (NGOs) remaining in Darfur to “expand their existing operations”. “We have also agreed to further improve the NGOs operating environment by easing travel and visas restrictions, by reviewing the need for individual technical agreements for NGOs,” he said. He was speaking during a visit to Sudan by UN humanitarian chief John Holmes and US envoy to Sudan Scott Gration. Mr Holmes said that if trust was restored between the humanitarian community and Sudanese authorities, capacity lost after the expulsions could be recovered. “I think what we’re hearing… is that new NGOs with new names, new logos, if necessary, can come in,” he was quoted as saying by Reuters news agency. So, Zuma has officially done it. He is President of South Africa. It will be interesting to see what impact he has. Will those who threatened to leave South Africa really leave? Will he be successful with his populist agenda? I was able to meet him at a lunch at UC Berkeley a little over a year ago where he — appropriately for his audience — made the argument that education would be a top priority. Will it? I also wonder about his impact on South Africa’s foreign policy. Mbeki had a clear agenda and goals with respect to the African region. Will Zuma embrace the African Renaissance? Will he improve on NEPAD, or let it falter? Will he continue the agenda of engagement with other major developing countries, most notably India and Brazil? I will definitely be watching! The leader of South Africa’s African National Congress, Jacob Zuma, has been officially elected the country’s president by members of parliament. He will be inaugurated on Saturday. The ANC won the general election in South Africa two weeks ago. 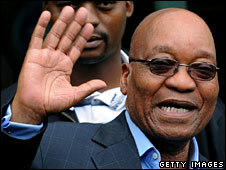 Mr Zuma’s government is expected to focus on the faltering economy, fighting crime, poverty and HIV/Aids. He faced corruption charges, dropped on a technicality just before the polls. He always denied any wrongdoing.